AssetCloud is an easy-to-use fixed asset tracking software with automated solutions for improved check-in and check-out processes, time-saving auditing, and correction-free reporting. 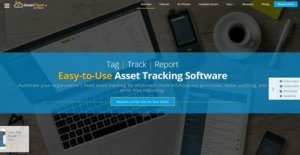 Developed by Wasp, it boasts of being the only asset tracking solution provider that delivers all the software, hardware, and asset tags that are required to rollout a fully integrated asset management system. The multi-deployment system has an easy-to-use interface to make data made accessible, adaptable, and reliable. A centralized role-based security helps save time by managing user accounts, permissions, and security settings in one place. Enterprise-grade, role-based security allows administrators to define fine-grained access rights for each user. AssetCloud has features to eliminate time-consuming manual tracking. Data is customizable to a user’s context so that searches are more accurate. One can also choose a standard report or build their own, with compiling and visualizing of data to keep others informed. AssetCloud has reporting functionalities that include 25 common, built-in reports for managing assets and gathering data-driven feedback. Each report presents a high level summary, plus permission to set parameters that can be drilled down into specific assets, time periods, and various data. These empower organizations into making well-informed, critical business decisions. The software’s report design engine delivers features needed to build clear and accurate reports. These can even be customized to be more apt for specific businesses. A scheduling feature automatically sends daily reports to ensure users receive the information required for their business. AssetCloud helps run easy audits to verify and remove inconsistencies. This clarifies what an organization actually owns and helps uphold accountability with accurate records. Apart from doing audits on computers, users can even run them on mobile devices from anywhere they are. AssetCloud sends comprehensive automated notifications for critical intelligence on asset-related events. These can be customized and set with triggers, thus empowering users to be better informed. Organizations can do inventory on identical multi-quantity assets, which deliver a rapid and reliable way of consolidating and tracking everything. The system helps save time as each item does not need to be tracked individually. With AssetCloud, organizations have a centralized repository for contracts, service agreements, and licenses. These help ensure that all requirements associated with vital agreements can be accessed by authorized personnel when needed. Expiring contracts can also be monitored properly. AssetCloud has 5 customizable methods of depreciation to help accounting teams maintain accurate booking. The feature is available in an easy-to-use and straightforward procedure so that personnel do not need to spend too much time on it. If you are considering AssetCloud it could also be beneficial to examine other subcategories of Best Fixed Asset Management Software listed in our base of SaaS software reviews. Since each enterprise has specific business needs, it is prudent for them to desist from seeking a one-size-fits-all perfect software application. Needless to say, it would be useless to try to find such a system even among widely used software solutions. The clever thing to do would be to catalog the various important elements that need consideration such as required features, finances, skill levels of employees, company size etc. Then, you should do your homework thoroughly. Read some AssetCloud reviews and investigate each of the other systems in your shortlist in detail. Such in-depth groundwork can ensure you discard ill-fitting systems and choose the app that presents all the elements you require for business success. How Much Does AssetCloud Cost? AssetCloud offers the following SMB and enterprise pricing packages for users to choose from. Give the details a look, and select the best plan for your business. We realize that when you make a decision to buy Fixed Asset Management Software it’s important not only to see how experts evaluate it in their reviews, but also to find out if the real people and companies that buy it are actually satisfied with the product. That’s why we’ve created our behavior-based Customer Satisfaction Algorithm™ that gathers customer reviews, comments and AssetCloud reviews across a wide range of social media sites. The data is then presented in an easy to digest form showing how many people had positive and negative experience with AssetCloud. With that information at hand you should be equipped to make an informed buying decision that you won’t regret. What are AssetCloud pricing details? What integrations are available for AssetCloud? If you need more information about AssetCloud or you simply have a question let us know what you need and we’ll forward your request directly to the vendor.